Materials: Jasper, Jet and Burgandy chips. 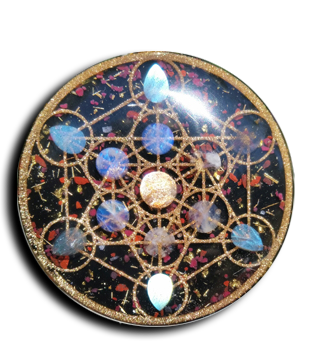 It contains 23.5K Gold Leaf with Quartz and Noble Shungite, Turquoise and Brass shavings; one Blue Sapphire. Metatron’s Cube resonates with the highest force that can be imagined throughout all of creation. The design of 13 interlocking circles supersedes all other geometries including the Flower of Life and includes the five platonic solids in its layout. Metatron is the First Angel in the Tree of Life. In other traditions, Metatron is the “Scribe of God.” This design aligns the personal will to the divine plan. This pendant is cast with a custom brass powder and glow Flowering Lotus design. It features a faceted Blue Sapphire.